Les: After two weeks of fairly stellar entries in our space opera roundtable (no pun intended) thanks to Star Trek and Doctor Who, I suppose it was inevitable that one of our later entries would bring us back down to earth (again, no pun intended) by being less than excellent. And “less than excellent” is probably one of the nicest qualifiers I can come up with for the original Battlestar Galactica, progenitor of the franchise of the same name and inspiration for the critically acclaimed 2004 reboot. Written by Donald Bellisario (who went on to create such iconic series as Magnum: P.I., Airwolf, and the last show apparently anybody watches live in NCIS), “The Long Patrol” is an episode that presents the Colonial Fleet at the edge of their known space, preparing to strike out for a new galaxy to settle in after their old world was destroyed. Ace pilot Starbuck (Dirk Benedict, The A-Team‘s Templeton “Face” Peck) is sent out on a scouting mission in an experimental Viper plane, only to have it captured by a smuggler of this universe’s equivalent of single-malt scotch. The plot is competent enough in setting up the stakes, though details on exactly why the fleet is out there and what exact threat the Cylons pose are details left chiefly unexplored—having not seen any of the early episodes I’m not sure how serialized the show is supposed to be, and it’s entirely possible they got all that out of the way early on. Galactica evidently took a lot of flak for being a Star Wars knockoff (Universal was even sued by 20th Century Fox for copyright infringement [Ed. note: It got really bad during the filming of Empire Strikes Back. -Noel]), and it’s not hard to see why. 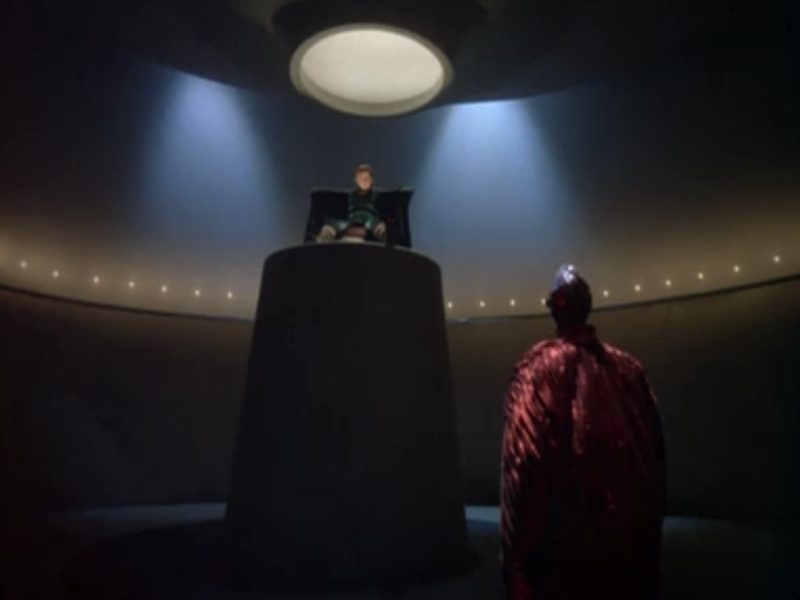 The show premiered in 1978, a little over a year from the debut of Star Wars, and you can see the DNA of that franchise tied inextricably with Battlestar‘s aesthetic. The sounds of the spaceflight and laser fire bear more than a passing resemblance, the Viper is clearly modeled after an X-wing, even Apollo’s outfit and Starbuck’s haircut are reminiscent of Han Solo and Luke Skywalker respectively. 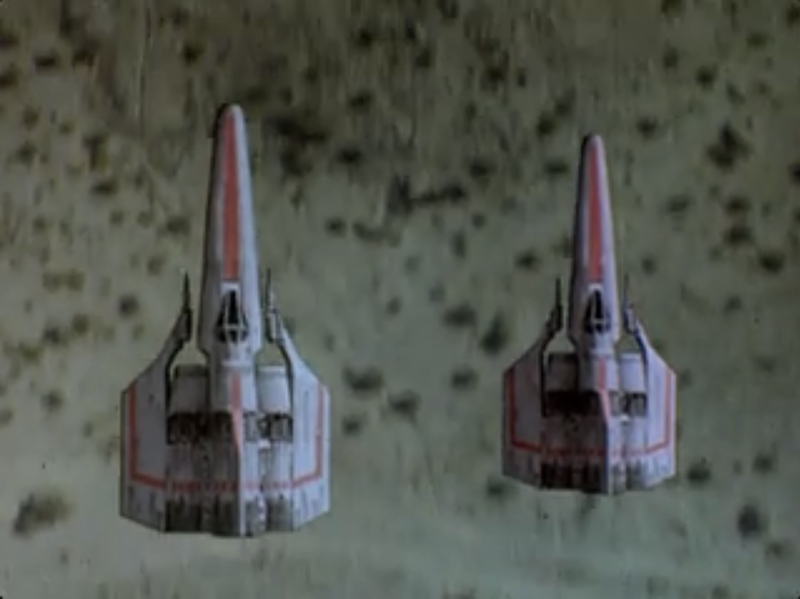 However, that doesn’t bother me much, and I’m actually impressed by what they’re able to do on a 1970s TV show budget in producing the dogfights between the Vipers and the Cylon fighters. (Though this is undermined somewhat by remembering that the film Space Mutiny, eviscerated so memorably on Mystery Science Theater 3000, used the exact same footage for its own space scenes, which unfortunately colors my impression.) 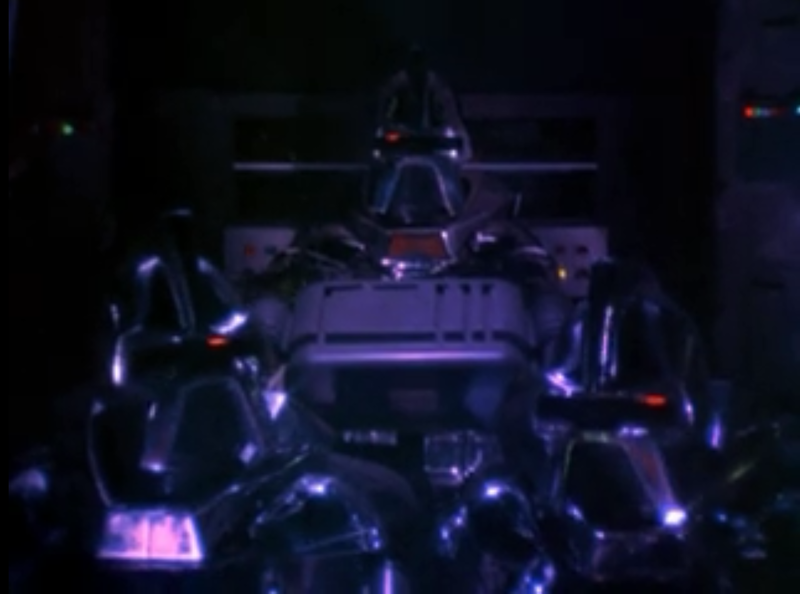 In the brief glimpses that we see of them, the Cylons are clunkily designed, but there’s an ominousness to their faceless appearance that helps convey some of the fear the convoy feels. I also like the ragtag appearance of the fleet we get in the few exterior shots, as it makes them seem less like a uniform entity and more one working to hold itself together. Really for me, the problem is that the show isn’t tonally consistent in any way. The entire series is motivated by that the Colonial Fleet is delving into the unknown to find a new world to settle on, while being pursued by the Cylon hordes in a matter you think would have everyone on a knife’s edge at all times. But at the same time, you’ve got things like Starbuck channeling Three’s Company by trying to juggle two dates at the same time (one of whom is the daughter and sister of his respective commanding officers, in what seems like a particularly boneheaded move), and then you’ve got Commander Adama playing the kindly grandfather role to Boxer by telling him a bedtime story. There’s also Starbuck working a get-rich-quick scheme into what’s supposed to be an important mission; the personality of Starbuck’s on-board computer CORA, who I believe is HAL 9000’s slutty sister; and of course there’s Muffit, that terrifying robot/dog/monkey thing that made me scream every time it appeared on screen. I think you could have all of these things functioning together within the same series, but the execution isn’t competent enough to put it all on the same wavelength. *Fun bit of This Was TV trivia: one of the prisoners is played by Arlene Martel, who long-time roundtable readers will remember also played Robert Culp’s love interest back in The Outer Limits episode “Demon With a Glass Hand.” Between Mr. Trent and Cylons, humanoid robots just won’t cut her a break. We’ll be revisiting the Battlestar reboot at the close of this roundtable series, and let’s just say that the bar has been set fairly low based on “The Long Patrol.” I wouldn’t say I hated it, but unlike our last two installments this is a show I’d have to make an effort to watch more of. J.: Damn you, Les, for referencing Space Mutiny before I got a chance. I spent this entire episode waiting for Blast Hardcheese to show up. The biggest problem for me here—aside from the wild tonal shifts, or the flaky performances, or even the bizarre, jerky pacing—is the way the characters seemed to have completely forgotten the very concept of the series in which they’re appearing. Starbuck is sent off, unarmed, to another star system* to chase down distant life signs, and he actually finds another human… but the first thing he cares about is how much money he can make selling the ambrosia the guy is smuggling. And this is after the sitcom shenanigans with the two dates, where Starbuck grouses about how many cubits his scheme is costing him, and that weird maitre d’ is giggling at how much money he’s wasting, and I kept thinking, why do you care about money? This is trying to be a story of a society on the brink of extinction, but it’s also trying to be a whizz-bang-neato space opera for kids, so the actual premise for the show ends up shoved into the background. And when it does come up—like when Boomer and Apollo worry that they’ll have to destroy Starbuck’s only way home to avoid letting the Cylons track the fleet—it results in one of those tonal shifts that don’t work at all. While I don’t know much of the history of this series, part of me wants to believe that Glen A. Larson had a darker, richer show in mind, but the release of Star Wars pulled Galactica in a much more youth-oriented direction. *At least, I thought it was just another star system. But I think Starbuck has a line where he mentions he’s from another galaxy. But then this planet is an old Colonial settlement; but then, it’s also so far away that no human has ever been there? The stellar geography here was completely baffling. Maybe it was just me? Which reminds me: this is supposed to be a show for kids, right? That’s the only explanation I can think of for the Star Wars aesthetic and the presence of Muffit (who is pure nightmare fuel). But if that’s the case, why does the entire plot of the episode revolve around alcohol? 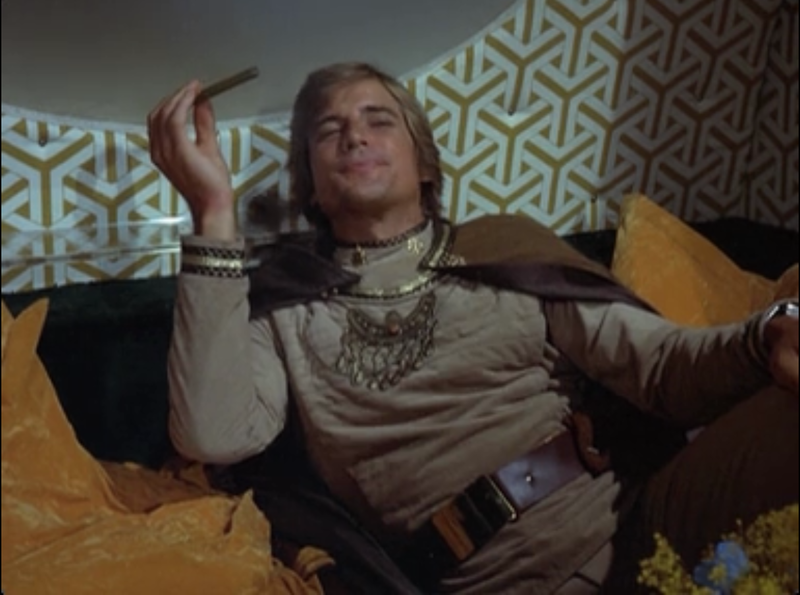 And is it weird that Starbuck is chomping on a cigar all the way through his double dates? And what of the uncomfortably sexual nature of his relationship with that ship’s computer? Much like the shifts in tone, this episode seemed to have no idea who its audience was. Of course, I know that, if I was ten years older than I am, I would have loved this as a kid in 1978. Even if the plot is inscrutable, and the tone is schizophrenic, it doesn’t skimp on the whooshing spaceships and the completely gratuitous laser fights. (Favorite moment: while chasing the smuggler, Apollo tells Boomer not to shoot at the guy, and then—not six seconds later—Apollo shoots at the guy.) In an immediately post-Star Wars world, I can see where Battlestar Galactica may have found a place in the heart of kids who couldn’t wait for more of the real thing and were willing to settle for this cheap knockoff. But seriously: what, exactly, was Muffit supposed to be, anyway? It looked like a Xenomorph had gestated inside a Teddy Ruxpin. Shudder. Jessica: The reboot is one of my favorite television shows of all time, so I try very much to be fair with what the original actually was, or could do as a network sci-fi show in the early eighties. But Space Irish, why did it have to be Space Irish? And even in that, there was a seed of a fascinating story. 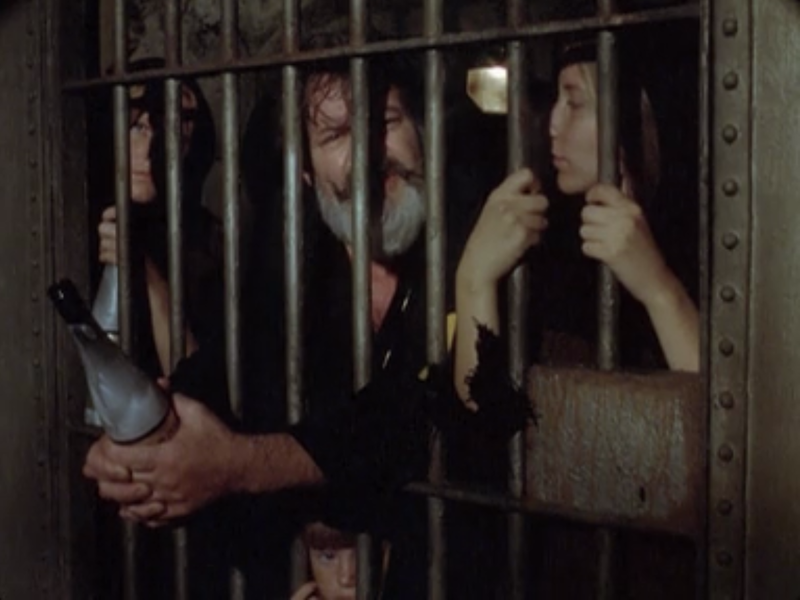 A very Catholic treatment of Space Original Sin, with a prison with no guards or locks and the descendants of the original convicts dutifully going about their chores. When a friend and I watched the original a couple years ago I was struck by how much the reboot did take from the original, and how the original never seemed to understand it had stumbled on a really nifty idea for an episode. But here I go wanting to be fair. Complaining that a Star Wars knock-off didn’t want to be a moody examination of genocide and the moral event horizons we cross in our mad struggle to survive is a bit like drubbing Burger King for not serving lobster. I could do without the stale sitcom “two dates? oh boy!” shenanigans, but there is something to be said for how good a mood everyone appears to be in for having their species just wiped out. Buck Rogers had a similarly grim premise it cheerfully ignored (Ed. note: Which we’ll get to next week! – Les), and actually got away with it much better than Galactica did. But original BSG was all about playing to that ten-year-old in our hearts, who wanted to see robots, and spaceships, and robots flying spaceships. And on that count it did well, and is remembered fondly for a reason. 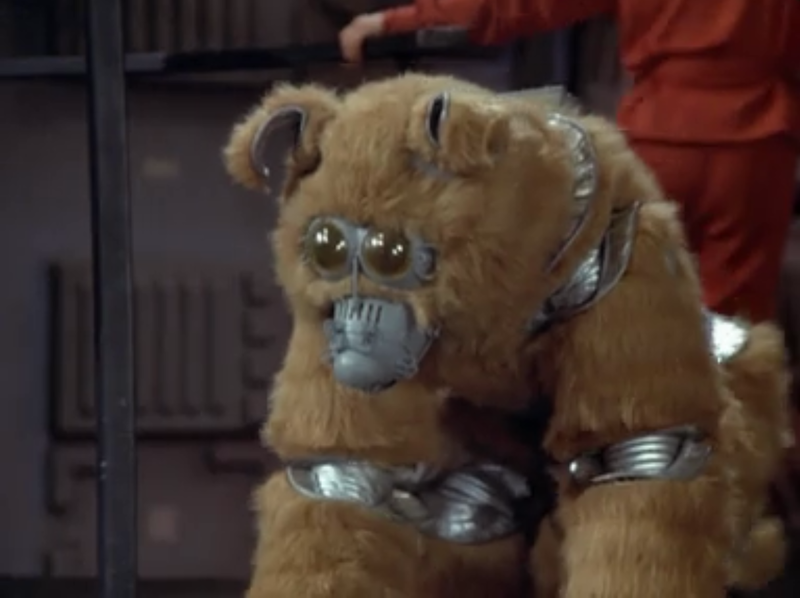 I still hold to my theory that Muffit should have been the Fifth Cylon though. Cameron: The original BSG suffers the same syndrome that occasionally plagues the revived Doctor Who. The multi-part episodes tend to be thin on plot ideas, which leaves viewers yawning as boring filler material takes up screen time. The single episodes, then, are so overwhelming with their concepts that it can be a bit much to swallow. The ideas presented in “The Long Patrol” aren’t all bad ones. Starbuck going out on a patrol and having something bad happen winds up being the focus of a great two-parter early in the reimagined series’ first season. The reimagined series also recycles the use of paintings of Earth, tying them to Starbuck in very meaningful ways. But there’s something to be said for tasteful execution. What made Star Wars so great is that George Lucas understood that being family-friendly didn’t mean that you had to actually have a family in the story. (He later subverts this notion with Empire Strikes Back and Return of the Jedi, but we’re talking A New Hope only at this junction.) In fact, that fundamental flaw of broadcast television brings down a lot of otherwise really good ideas. High concept can be grounded in character without the need for blood family ties. But the original BSG is too preoccupied with its sitcom-style ideas and Muffits to really grasp that concept. It says a lot about the original series’ gender politics, too, that a lot of this show’s problems in that area were addressed by Ron D. Moore and David Eick simply by casting women in roles originally played by men. That’s the original BSG in a nutshell, really: too busy trying to be Star Wars to actually be good, too busy telling war stories or rehashing sitcom plots to settle into its character dynamics, too busy being “of its time” to really look forward to the future. Two main problems with BG: 1) Glen Larson is/was a hack and 2) ABC was obsessed with making it as kiddie-friendly as possible (since it was impossible for any network to take science fiction seriously as a legitimate source of drama). In Larson’s defense, I’m sure you’re right that he had serious intentions for the series, of making something dark and exciting and human. But once ABC scheduled it for 7:00pm Central on Sunday and forced Larson to “dumb” it down, the series was in trouble creatively. It has been well documented how ABC’s scheduling and creative interference affected the show. Despite all that, the show was, in fact, a hit (but not a smash hit) and earned a second season based on its ratings. I don’t think ABC’s reasons for cancelling BG have been made clear, but I suspect the show’s hefty price tag was part of it. It would have been interesting to hear your thoughts on the majestic pilot (which is out there in at least three different cuts). 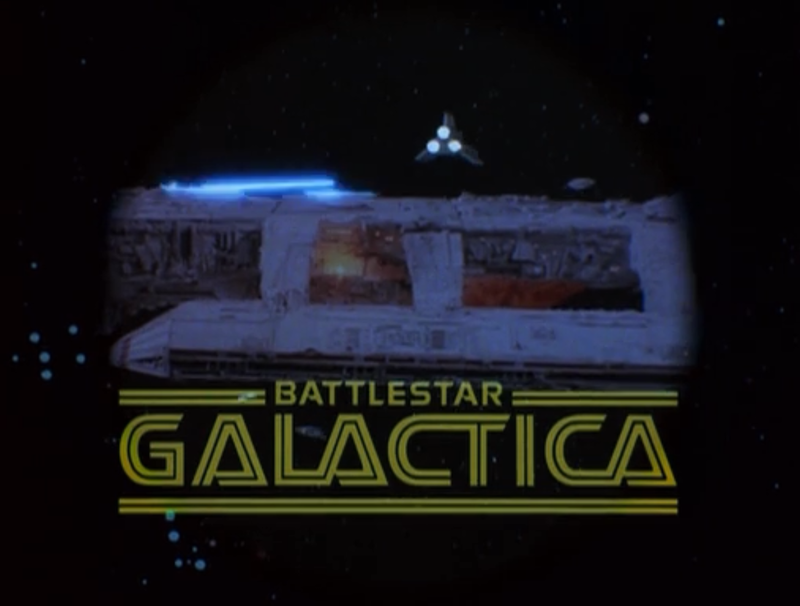 Awash in affecting dramatic scenes of tragedy, terrorism, and mass destruction, but still propelled by a grand sense of optimism, hope, and humanity, BATTLESTAR GALACTICA is perhaps more relevant now than it was in 1978. Thanks for choosing the frame with the cell. I’ve been looking for a still.